So the other day six lions strayed from the Nairobi National Park and wandered into the Langata residential estate. The lions had been spotted roaming the Langata area in the middle of the night, prompting the wildlife service to send in rangers. As always, Social media went into a frenzy with hilarious memes about the lost lions while some brands took the opportunity to show their digital marketing prowess. 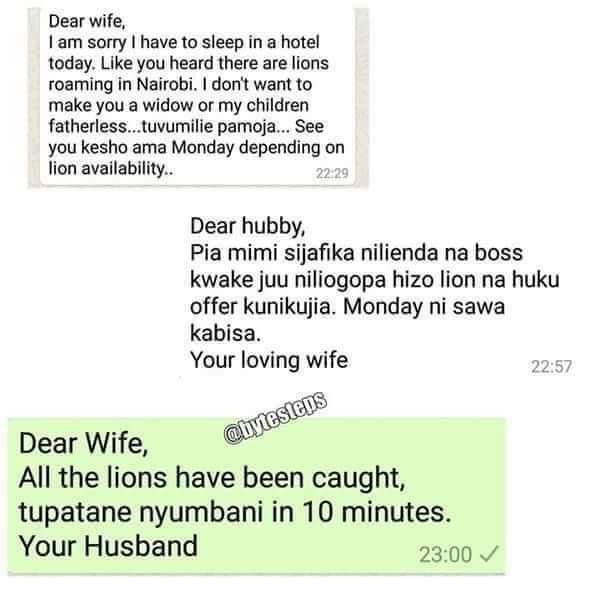 And team mafisi were also at it. Thank God because they have now returned back to the park . I know some crazy Kenyans would take this opportunity not to return home since yesterday claiming that there are lions on the road. Enjoy KCB Easy Taxi Rides at 14 Shillings!